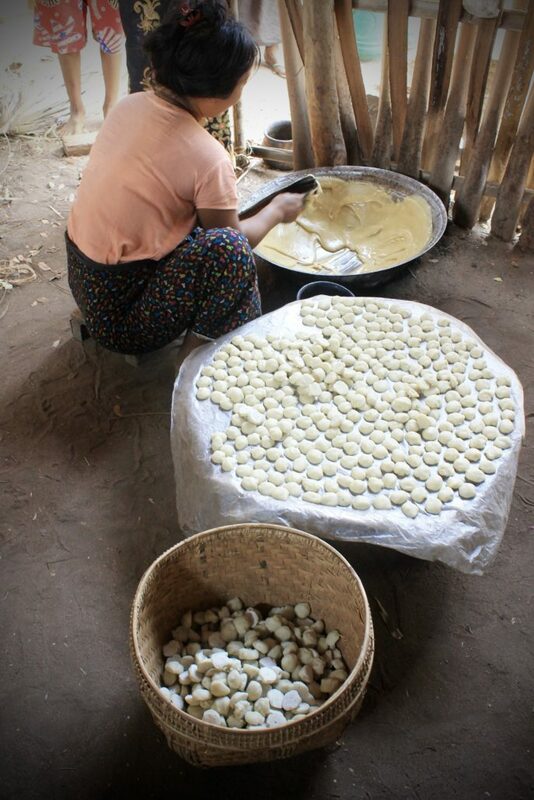 Ko Hmat Kyi, 46, is a small business owner in Tetma village, located in the Dry Zone of Myanmar. He supports his family through his palm tree and vegetable plantations. 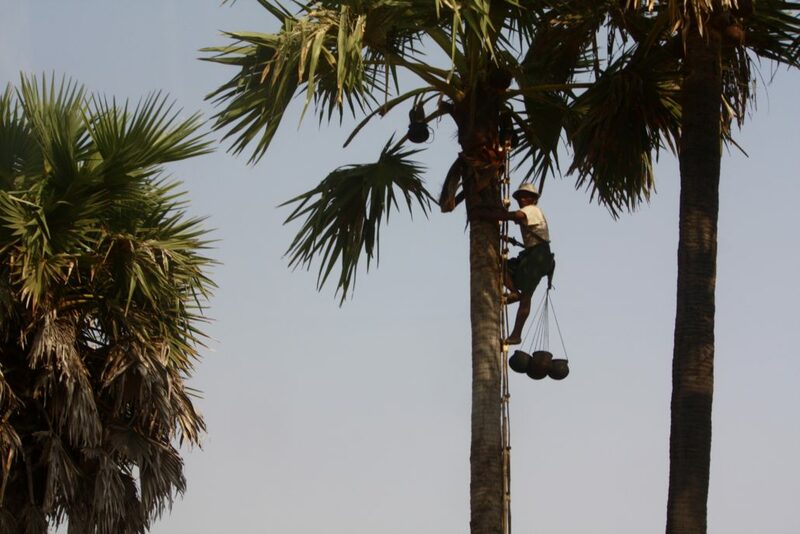 To make enough jaggery for trading, he has to climb 30 tall palm trees twice a day using a basic ladder made from two tall bamboos. The sugary sap is collected using a number of small earthen jars. After that, the liquid is mixed into a large pot, boiled and stirred until it thickens to a paste. The worker would then knead the product into small chunks which hardens after being cooled. 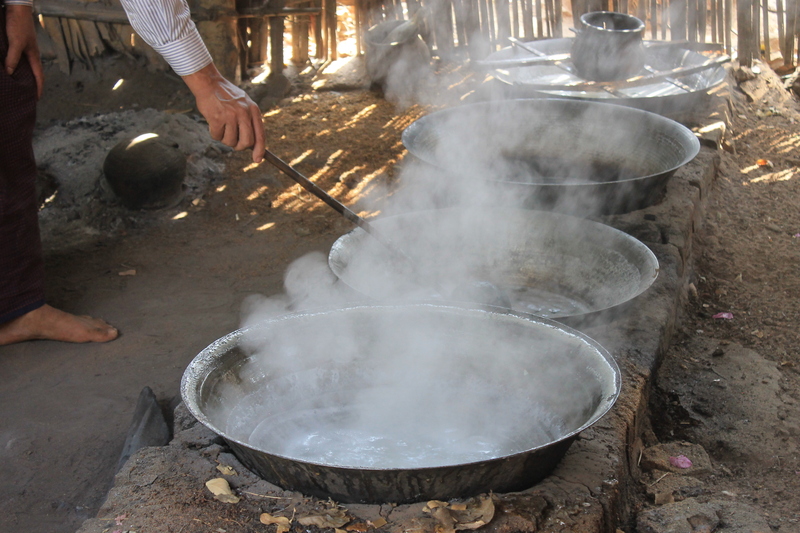 Inside the rudimentary kitchen where the jaggery is prepared, the air is hot, dense and sweet. In the past, Ko Hmat Kyi had no choice but to send his eldest son to fetch water in the day as his time was fully occupied with his jaggery business. To get clean water, his son often had to travel to a neighbouring village and queue for two to three hours to wait for his turn at the tube well or hand pump. This also meant that on days when he went to collect water, he would have to miss school. Things got better for Ko Hmat Kyi’s family in 2016. In partnership with Myanmar Engineering Society (MES), Lien AID completed a pilot project in Myanmar, enabling villagers in Tetma village to gain better access to clean water via a solar-powered, gravity-fed water distribution system. Ko Hmat Kyi told us that better access to clean water has not only made life more convenient for his family, but it also led to an improvement in the school grades of his eldest son. He was able to pass his university entrance exams and now studies at a university in the city of Yangon. Read more about our pilot project in Myanmar here. 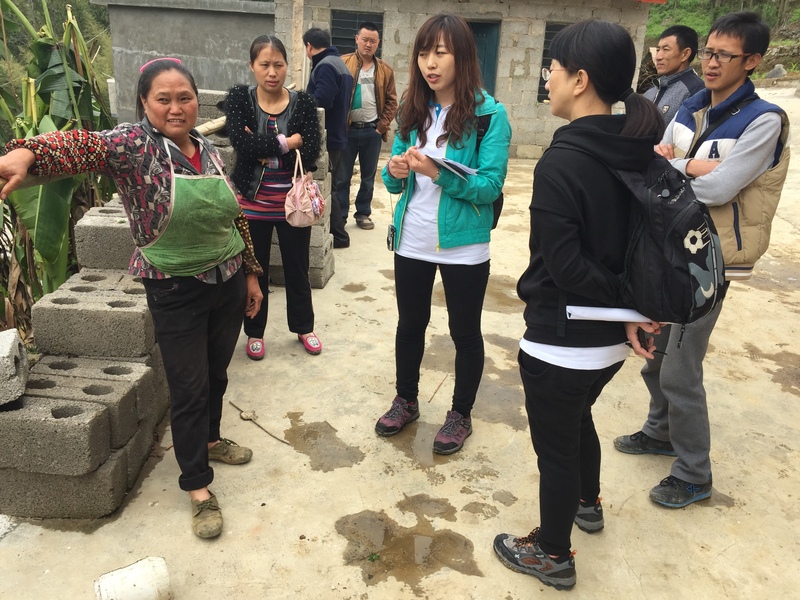 Back in June, we shared updates on some ongoing Village Water Management projects in China. 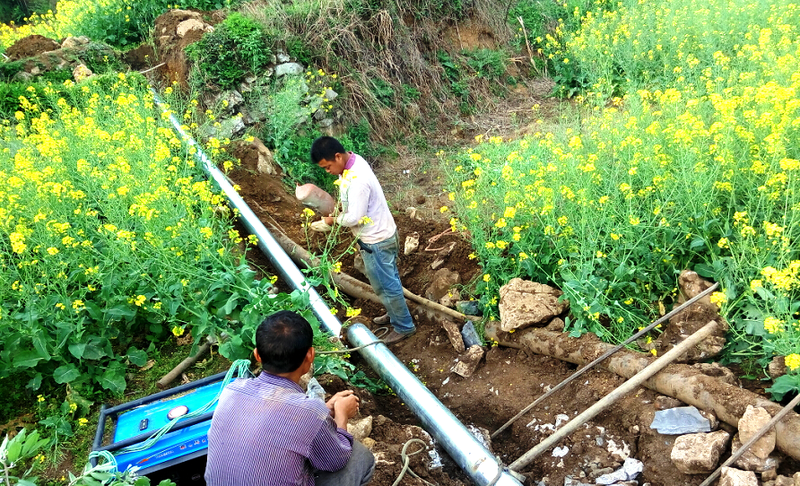 Last month, we completed inspection for three project sites in Shandong province and more than 5,000 villagers in Zhujiazhuang, Huangshanzi and Beishiqiao villages gained access to clean piped water. We are also continuing our efforts on post project monitoring for VWM projects completed last year. 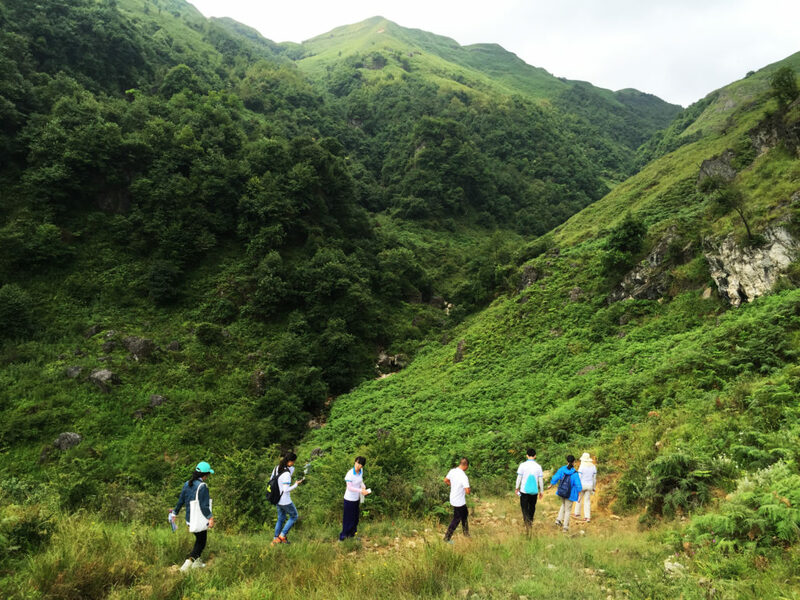 In the beginning of August, we visited the four villages of Qianjin, Jinggang, Sanyuan and Zhongying in Guizhou province, where clean piped water was brought to more than 7,000 villagers under the VWM programme. With the help of volunteers, we recorded water utilisation rates and examined operational documents and the conditions of water facilities. We also conducted house-to-house visits as well as interviews with members of the local water management committee. The information collected will be used for the post project sustainability assessments (PPSAs), which will aim to improve the effectiveness and outcomes of our VWM projects. 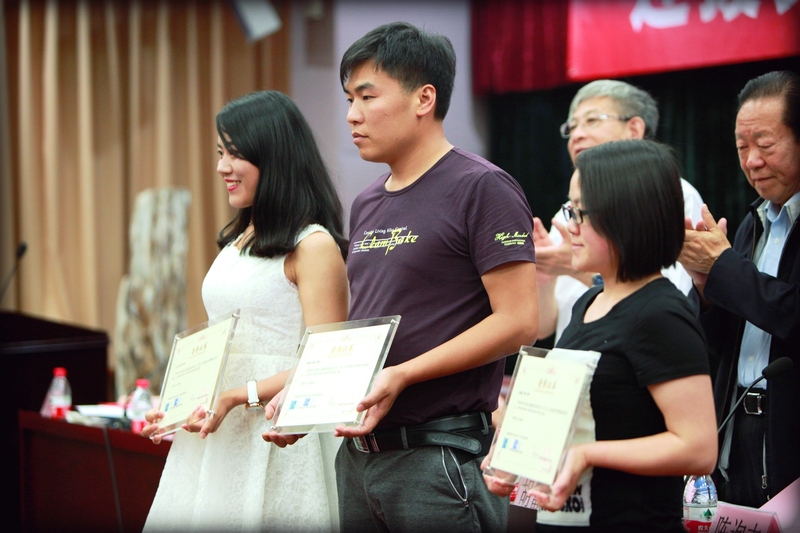 Learn more about the VWM programme in China here. To stay in touch with our latest updates, join our mailing list. We shared plans in May on exploring new sites for Community Water Enterprise (CWE) projects in Cambodia. Our team conducted feasibility studies in nine communes within Kratie province during end June and start of July, and identified four sites for further needs assessment. 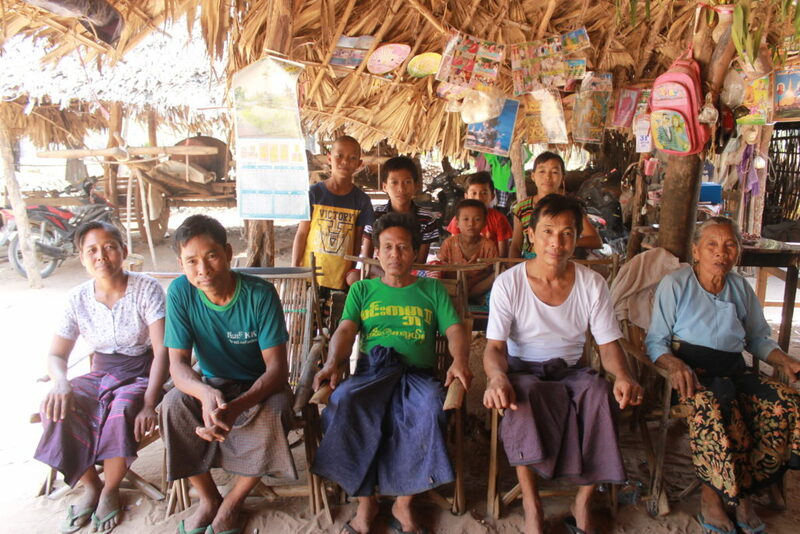 Through the feasibility studies and discussions with the commune councils, we found that villagers in Kratie province face the risk of exposure to arsenic-contaminated water and low water sanitation and hygiene practices. As piped water supply is only available in more populated areas along the river, villagers who live in remote locations face increasing difficulties in accessing clean water. In addition to the upcoming intervention in Kratie province, we are also picking up on the progress of ongoing CWE projects in Cambodia. In the past two months, our team set up water distribution points and selected local water entrepreneurs and water promoters over four sites in Prey Veng and Kampong Chhnang provinces. Water Management Committees (WMCs) and water entrepreneurs in Prey Veng province attended training on effective management and monitoring of water distribution systems while water promoters were trained on ways to increase awareness and understanding of clean water benefits among the villagers. Water promoters in Prey Veng province attend training (left); WMC members and water entrepreneurs attend CWE training (right). Plans are afoot for eight CWE projects across Kampong Thom and Siem Reap provinces. With WMCs established and commune council meetings underway, the construction of water treatment facilities and capacity trainings are expected to kick off in the coming months. Meeting with the commune council in Koul commune, Kampong Thom province (left); Current water source for villagers in Msar Krang commune, Kampong Thom province (right). Join us now to work together towards a common vision of better water governance and a future where sustainable clean water access is available to everyone. You can also learn more about our work in Cambodia here. Exhausted drinking water supplies, cracked river beds, dead animal carcasses and ruined crops – a barren and desolate sight greets many Cambodians as the country is gripped by one of the worst droughts in decades. According to a recent Channel NewsAsia report, many regions in Cambodia have not received significant rain since late last year and about two-thirds of the country now has insufficient drinking water. One of the regions is Kampong Thom province, where locals shared that they have not recalled seeing heavy rain for about a year. Clean water sources have become even more critical amid Cambodia’s drought crisis. Back in 2015, as part of our Cambodia three-year work plan, we identified Kampong Thom province as one of our key focus provinces. We conducted needs assessments and baseline surveys in seven communes within Kampong Thom province between 22 February to 3 March this year and found that most of the respondents acknowledged to falling sick from drinking untreated water. Join us now to work together towards a common vision – better water governance and a future where clean water access is available to everyone. You can also learn more about our work in Cambodia here. 22 March marks the annual international observance of World Water Day where we learn more about water related issues, be inspired to share and take action to make a difference. As we look forward to learning from the United Nations World Water Development Report that is launching on 22 March, we are taking this opportunity to share our recent Community Water Enterprise (CWE) project handover to the communities in Banteay Meanchey Province, Cambodia, last Wednesday, 16 March 2016. This CWE project was implemented in partnership with Ministry of Rural Development (MRD) and Asian Development Bank (ADB). MRD and ADB had improved access to clean water with the development of community ponds, wells and rainwater jars previously. Lien AID joined the partnership and worked with Provincial Department of Rural Development, local authorities and commune councils to set up water treatment plants to enhance the quality of drinking water, as well as to train new Water Management Committees and water entrepreneurs, in both Phnom Dei and Bos Sbov Communes. Under this CWE project, these water entrepreneurs will be serving and selling clean affordable bottled water to 15,000 villagers. 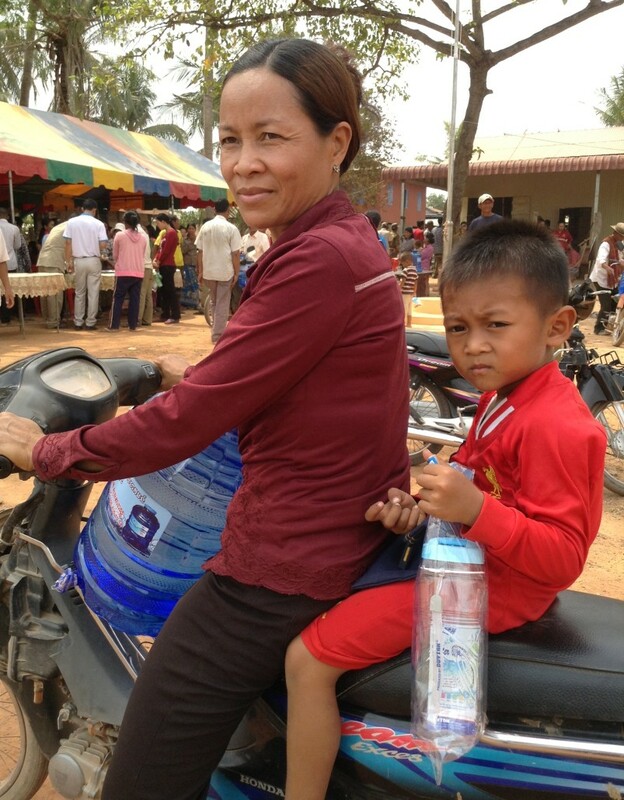 Ms Tark Sanith purchased clean bottled water at the handover event in Banteay Meanchey Province, Cambodia, on 16 March 2016. Expanding our programmes for 120,000 new beneficiaries in 47 communities across four countries – Cambodia, China, Myanmar and Vietnam. Enhancing programme and technical support for Monitoring & Evaluation of our projects. 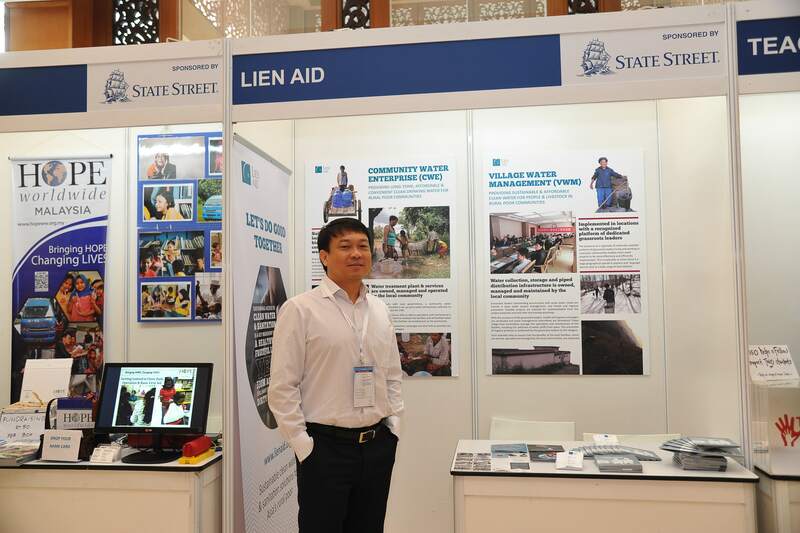 Increasing public awareness on the issue of clean water and sanitation in Asia, as well as Lien AID’s mission. Back in January, we shared some of the groundwork completed for upcoming projects in China, Vietnam and Myanmar. In Northeast Vietnam, we have since completed our Phase II research in four villages in Bac Quang and Vi Xuyen Districts and we are starting our pilot projects in two of these villages this month. Stay tune as we share significant learnings and milestones from these pilot projects in Northeast Vietnam, as well as our 8th batch of Village Water Management (VWM) programme in China, pilot project in Tetma village, Magwe division, Myanmar and CWE projects in Cambodia in the coming months! From the post-project monitoring and evaluation activities of previous projects, delivered under the Community Water Enterprise (CWE) programme in Cambodia, we identified the inability (of the water management committee and water entrepreneur) to raise demand levels of bottled water as a key challenge to the financial sustainability of the water service delivery. As such, we recently piloted a clean water demand creation initiative that was implemented in Krang Svay commune, Prey Veng province, where we had previously delivered a clean water project (under the CWE programme) in March 2015. Monitoring data showed low take-up rate of the bottled water in the commune and as the stakeholders are very enthusiastic and committed, we selected this location to pilot the new initiative. This involved the engagement, training and deployment of 8 village water promoters who visited each of the 1,743 households in the commune as well as the setting up of retail distribution points at 27 village grocery stores. The initial results have been encouraging, with the reach of the water service delivery increasing by 12 percentage points at the end of the 3-month pilot. We will continue to monitor the outcomes of the pilot and may extend it to more project locations in the coming months, testing its efficacy and finding ways to make the process more efficient. 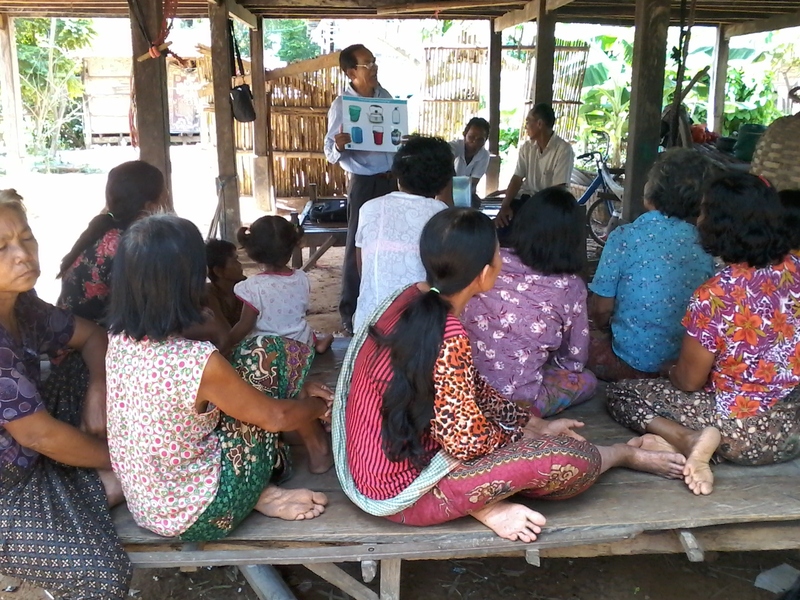 Separately, 631 villagers attended our village talks promoting safe hygiene practices, a key component of our Community Water Enterprise programme, in the 15 villages in Phnom Dei and Bos Sbov communes in Banteay Meanchey province. The CWE projects in these 2 communes are being implemented as an extension to the Asian Development Bank funded Community Pond projects, in partnership with the Ministry of Rural Development. All 12 of the projects initiated under the 6th batch of our Village Water Management programme in China have been completed, with final inspections of the completed water infrastructure for 8 of these conducted in December (the rest had already been inspected much earlier). 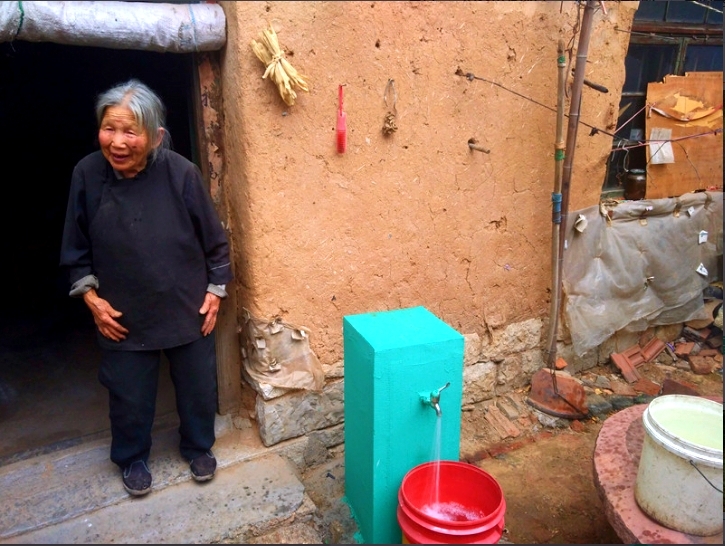 The projects in the 2 villages of Babu and Taihe in Yunnan; 3 villages of Beihu, Qiaotoujuwei, and Zhongba in Chongqing; 7 villages of Daba, Tiantai, Baoyuan, Lianhe, Huangtian, Nabei, and Xincai in Guizhou, will provide continuous and sufficient clean water to 13,392 rural poor, through water storage and distribution networks bringing the piped water directly to their households. This batch of projects benefitted greatly from the participation and support of CITIC Envirotech, whose employees volunteered their time to speak at our workshop (for the 6th batch, held in September 2014), sharing their experiences and knowledge on project management, construction safety, as well as professional development. They also provided professional advice on the engineering design of the infrastructure for the projects which they generously co-funded as part of our multi-year agreement. Following the review and evaluation process of the 30 proposals received from the workshop for the 8th batch of our Village Water Management programme in China, 13 were finally selected for implementation. Of these, 5 are located in the province of Hunan, 6 in the province of Guizhou and 2 in the province of Shandong. The projects in Shandong represent our first foray into this province and we conducted a training session at the 2 villages in Shandong, which was attended by 10 of the project stakeholders. Having concluded our projects in the delta region of Vietnam at the end of 2014, 2015 saw us embark on exploratory activities in other regions of Vietnam, as we were unable to identify suitable new locations in the delta area for our interventions. According to the Joint Monitoring Programme, Vietnam now boasts a 96.9% rural coverage rate for improved water supply. We identified the mountainous region of Northeast Vietnam as a possible area in which we could reach out to rural poor communities still lacking in clean water access and partnered with WARECOD, to conduct in-depth research and analysis of the water and sanitation situation of the communities there. Phase I of our research has been completed and we are now in Phase II, having selected 2 villages each in the Bac Quang and Vi Xuyen districts, for further study to identify possible resource gaps and challenges that we can target with our interventions. Our pilot project in Tetma village, Magwe division, has finally reached the construction phase, with project details finalised with all stakeholders during our recent site visit. This pilot is being implemented in partnership with the Myanmar Engineering Society (MES) and involves the implementation of a gravity-fed piped system that will distribute water from an existing tube well to shared water points in the village. At the same time, we will also test the viability of pumping water (from the well) with a solar powered pump. This pilot, like all our projects, incorporates components of health and hygiene promotion, and the setting up and training of water management committees. On 19th November, we participated in the Green Night: Marketplace, where 5 other organisations in the non-profit environmental sector in Cambodia also showcased their work and products. Held at the Meta House in Phnom Penh, the Green Night is a bimonthly event, comprising a marketplace and series of talks, for media and development sector professionals to gather and exchange ideas on regional environmental issues. 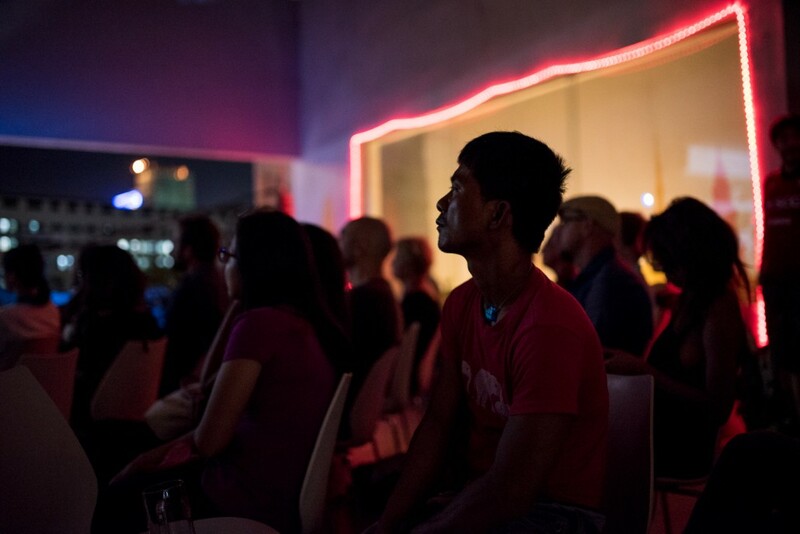 For this edition of the Green Night, our partner for A River’s Tail, Longtail Media, were also the keynote speakers, and gave a moving presentation of their experiences working on A River’s Tail, a yearlong multimedia exploration of the Mekong River. 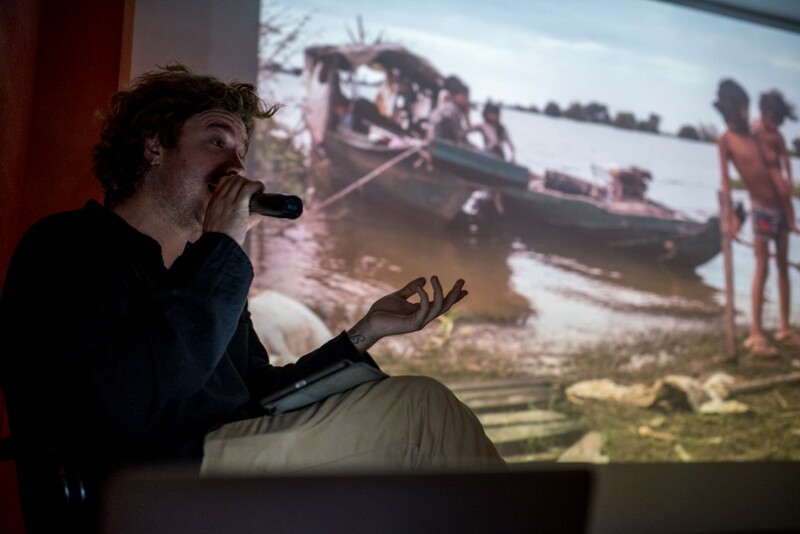 The presentation captivated the audience of roughly 80 environmental experts and media enthusiasts with stories of the people they met along the way, the water and environmental issues facing the Mekong, and the benefits and challenges they faced working on this ambitious documentary. The construction of 9 Community Water Treatment Plants in selected communes (refer here to previous field notes for more details) was completed in October, with all plants passing water quality tests based on local drinking water standards. This follows the completion of September’s training of the entrepreneurs and community water management committees, which focused on developing skills necessary to effectively manage a Community Water Enterprise and building technical familiarity with the operations of a Community Water Treatment Plant. A quarterly review meeting with entrepreneurs and community water management committees whose enterprises have been under their management for a period of two years was held, and is our way of ensuring the long-term sustainability of the community water enterprises continues. With periodic check-ins even after the enterprises are handed over, an open channel continues to be available, where all parties involved can iron out any issues affecting the sustainability of the operations. We carried out a feasibility study at the ‘Humanitarian Centre Bamboo Village’ in Dong Nai province to assess water and sanitation needs of the centre. The centre houses the elderly and helpless; abandoned children; children with disabilities and children with cerebral palsy where families are unable to care for. The quality of water from the two tube-wells on the compound is being tested, the result of which would determine our next steps forward. We held project management training for 7 Student Village Officers (SVOs), several Water Management Committees members and local authorities in the provinces of Shandong and Yunnan. The training equips participants with the tools and skills integral to successfully executing a water and sanitation project. During the session, our project managers shared candidly on past project management experiences and explained how they resolved real issues faced in the process. The training offered SVOs a comprehensive perspective and fostered good working relations for all involved. We participated in the 9th CSR Asia Summit held in Kuala Lumpur in October, showcasing our Community Water Enterprise and Village Water Management programmes to over 400 delegates from across 28 countries. The summit is an annual conference on corporate social responsibility in Asia and networks business, government and civil society representatives to discuss issues such as challenges in development, as well as the environment and sustainability. This year, the spotlight was on the leading issues of water scarcity, climate change, and conservation, underlining how environmental resources will continue to present some of the biggest challenges over the next decade. The tender for the construction of the 9 Community Water Treatment Plants in the selected communes (refer here to previous field notes for more details) were officially awarded in packages to 3 specialist contractors. The construction phase of the projects is expected to end in early September, with training of the entrepreneur and the community water management committee to take place after that. Health and hygiene promotion will also be conducted to the villagers after the training sessions and water quality testing is completed. After a few months of discussions and testing of the water sources, we finally signed the Memorandum of Agreement with the Banteay Meanchey Provincial Department of Rural Development as well as the commune chiefs and commune council members of Bos Sbou and Phnum Dei communes, for the implementation of 2 new projects under our Community Water Enterprise programme. These projects are an extension of the Asian Development Bank funded Community Pond Projects. More details on this will be published in a separate post. The projects in the 5th batch of the Village Water Management programme in China were completed in July after several delays in Anshun due to national rail works in the province that have obstructed access to the selected water sources. 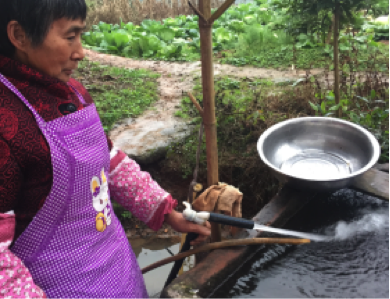 These projects have been generously co-funded by the Coutts Foundation and have enabled 17,959 rural poor in the prefectures of Zunyi, Anshun and Bijie to gain access to piped clean water. Read more about the challenges and outcomes here. 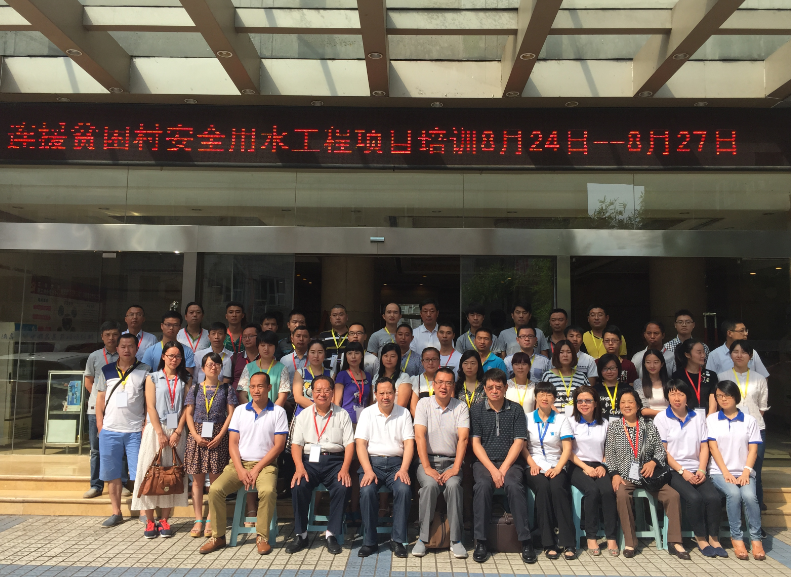 From 24th to 27th August, the training workshop for the 8th batch of the Village Water Management programme in China was carried out. 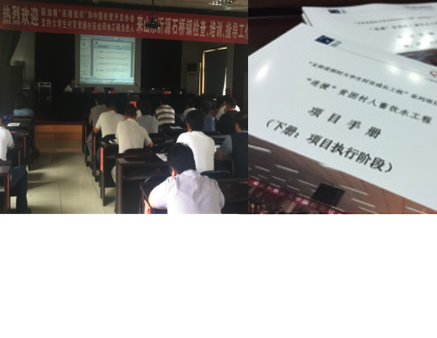 44 Student Village Officers, County Water Department Officials and other partners gathered in Chishui city, Guizhou Province for the workshop. 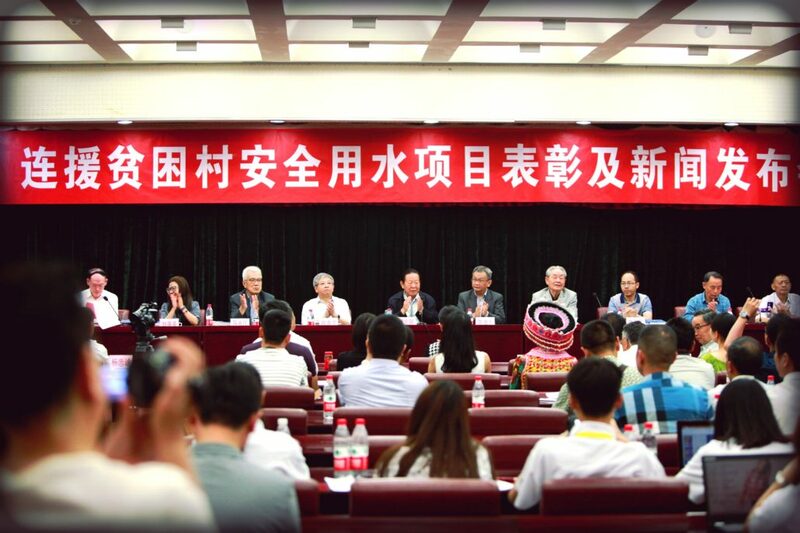 The opening ceremony of the workshop was graced by leaders from the China Association for Poverty Alleviation and Development, the Chongqing Association for Poverty Alleviation and Development as well as management staff from CITIC Envirotech Limited who volunteered their time to share their professional knowledge about water treatment and career development lessons during the workshop. Find out more about their involvement in a separate post to be published soon. The workshop participants represent 30 rural poor villages with clean water needs in Guizhou, Hunan, Shandong, Hebei and Chongqing. The 4-day workshop delved into topics related to small – scale water project management, with a particular focus on teaching participants how to conduct needs assessment and draft water project proposals. After the completion of the workshop, our team in China will be conducting on-site assessments of the 30 proposals and the final list of projects selected for implementation will form the 8th batch of projects to be delivered under the Village Water Management programme in China. 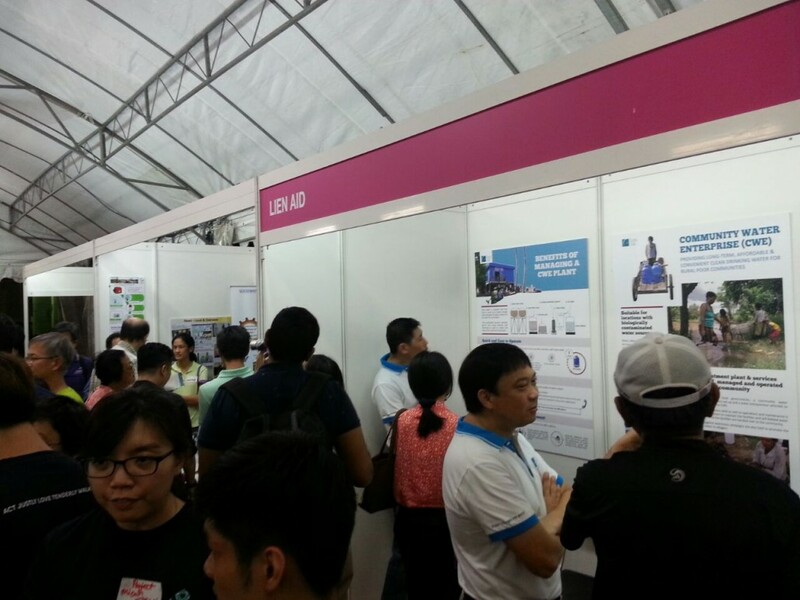 This update is a little late but we participated in the Humanitarian Forum and Fair on 30th May, showcasing our Community Water Enterprise programme in an exhibit during the Fair. Held at Catholic Junior College, the Humanitarian Forum and Fair is a biennial event for dialogue, inspiration and connection on humanitarian initiatives in the region, organised by Caritas Humanitarian Aid & Relief Initiatives Singapore (CHARIS). Field Notes for April and May, 2015. 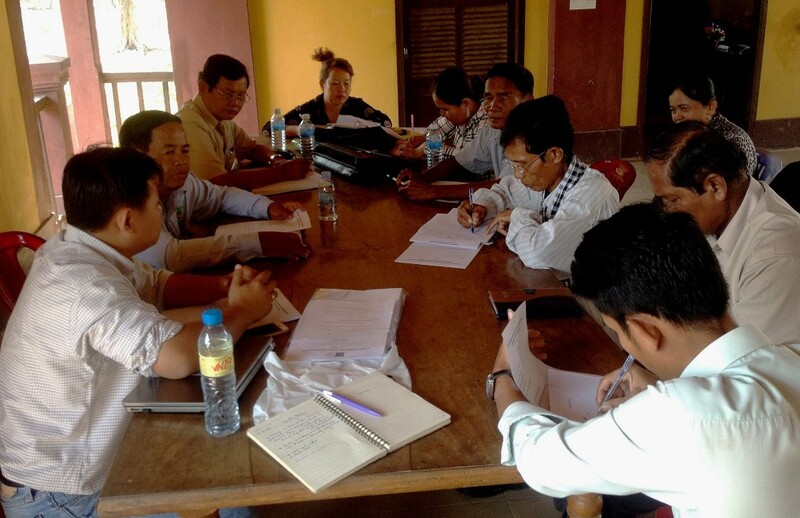 In April, as part of the final stage of the pre-project development process, Lien AID held a series of meetings with the respective local commune councils and village leaders from each of the identified communes. These communes were selected from our previous needs assessment and situational analysis process and we wanted their reaffirmation of commitment to the projects. 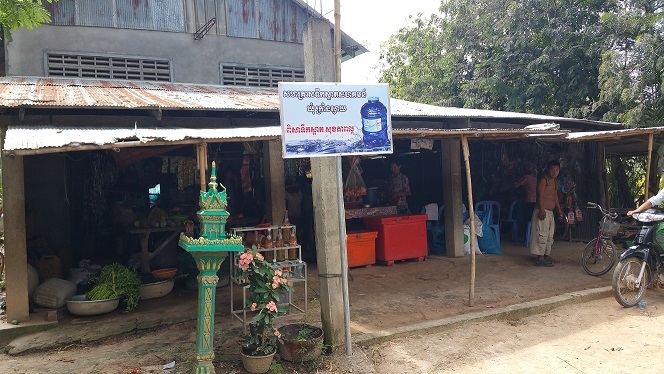 We took the opportunity to explain in further detail the ownership and management approach of our Community Water Enterprise programme in Cambodia and respond to their questions and concerns. Subsequently, the agreements for 11 new projects that will be delivered under our Community Water Enterprise programme in Cambodia (2015), was officially signed in May. Among these, 2 each are in the Banteay Meanchey, Kampong Chhnang and Pursat provinces, with the remaining 5 communes (projects) in Takeo province. CWE project kick off in Takeo province, Cambodia. Among the 35 water project proposals received for the 7th intake of our Student Village Officer training workshop conducted in March, we went on to assess on-site situations for 12 of those in April, with another 17 completed in May. Together with the Student Village Officers and village officials for each of the respective projects, we assessed village conditions and water situations through observations and interviews with the villagers. Over a span of 10 days in April, we covered 7 villages in the counties of Malipo, Shidian and Lianghe in Yunnan Province as well as 5 villages in Chishui county, Guizhou. 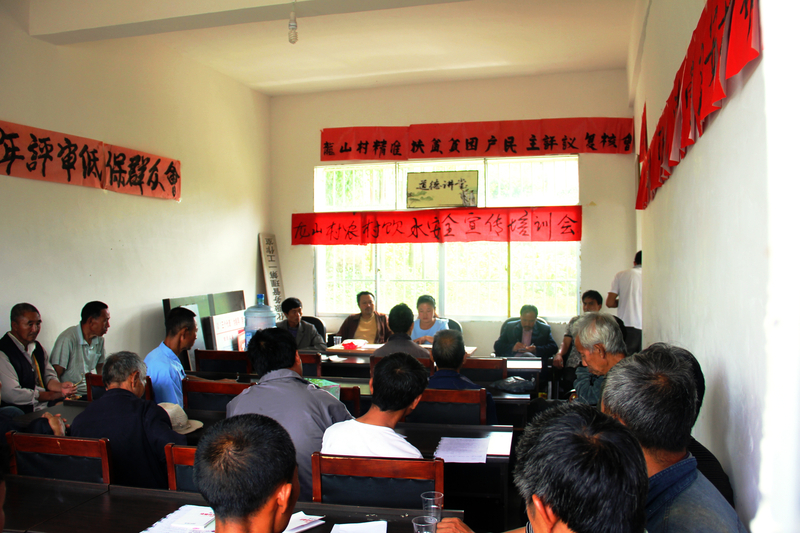 Our local partners and stakeholders – Guizhou-Chishui Council for the Promotion of Construction in the Old Revolutionary Areas; Yunnan-Malipo Foreign Aid Office; Yunnan-Shidian Poverty Relief Office; Yunnan-Lianghe County Government were also involved, facilitating meetings and discussions. In May, we had a much tougher schedule, travelling to the counties of Wushan and Wuxi of Chongqing Municipality, the counties of Meitan and Luoyang in Guizhou, Sangzhi county of Hunan, and surveying 17 villages in 22 days. Our local partners involved in these projects are the Chongqing Poverty Relief Office; Guizhou-Zunyi Council for the Promotion of Construction in the Old Revolutionary Areas; Hunan-Sangzhi Poverty Relief Office. Such on-site assessments are critical to our programmes as they enable us to better evaluate the suitability of the proposals through a first-hand understanding of the situation and sentiments on ground, while acting as a data validation exercise as well. Project inpection in Jiexi village, China. 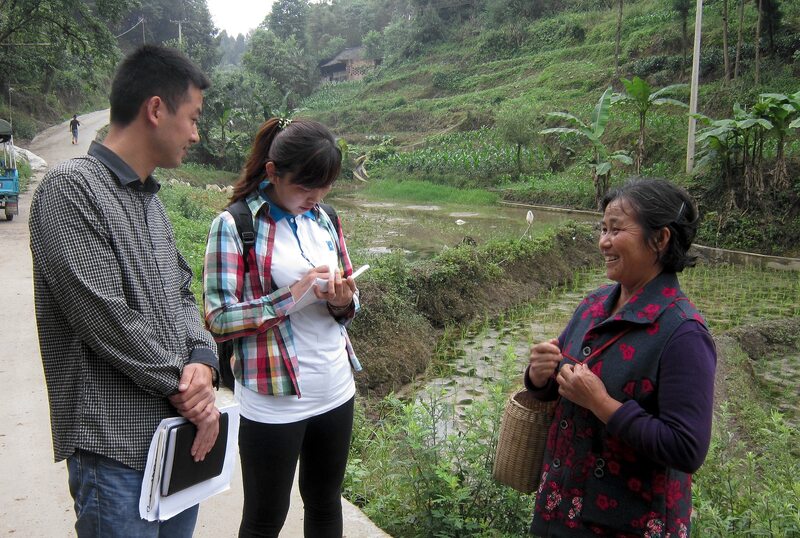 Needs assessment in Tieguang Village, China. 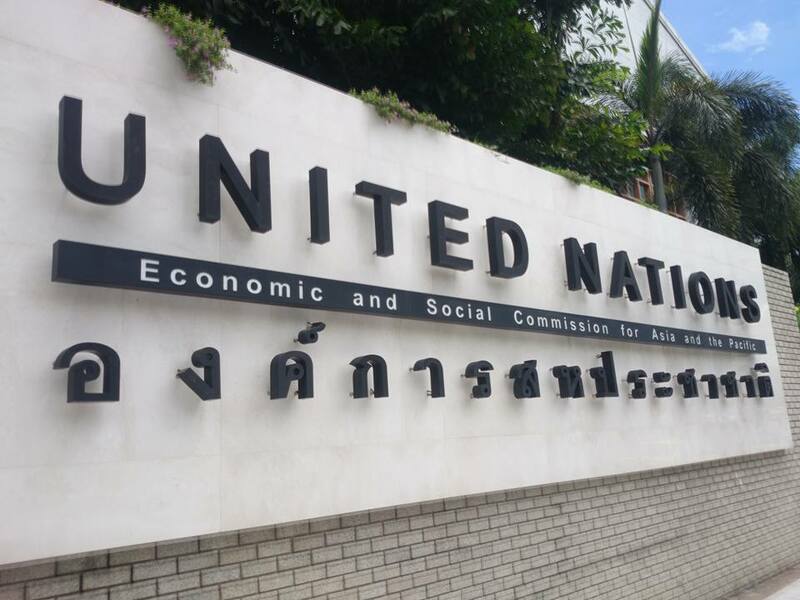 Our Digital Strategist Jeremiah Rogers gave a lunchtime presentation about marketing for A River’s Tail at the United Nations in Bangkok. You can read his writeup here and also find a link to the full presentation. http://www.lienaid.org/wp-content/uploads/2015/07/Screen-Shot-2015-07-07-at-10.55.25-PM.png 734 1486 Lien AID http://www.lienaid.org/wp-content/uploads/2014/10/logo-lienaid.png Lien AID2015-07-07 23:17:482015-07-08 00:31:48Field Notes for April and May, 2015.